Provide comfort for the family of Delbert Winters with a meaningful gesture of sympathy. Peacefully at Grey Gables Nursing Home, on Sunday, December 30, 2018 in his 80th year. Beloved husband of Ruthe of Maxwell. Loving father of Susan (Gord) Johnston of Vandeleur and Wayne (Susan) Winters of Maxwell. Delbert will be greatly missed by his grandchildren Jeremiah, Jonah, and Laura. Predeceased by brother Rae and infant sister Olive. Delbert lived on the 4th line near Maxwell all his life. He spent many years working as a builder and mason but after some time, was guided to his calling of counselling. He applied lessons learned from his own struggles to help people with addictions and other needs. As an active member of the Maxwell Community Centre board, he served many years as chairman, having successfully fundraised to repair and maintain the ever loved building. Delbert’s grand presence as the “Mayor of Maxwell” has been greatly missed over the past few years while he’s been living in Grey Gables. May your fond memories serve as a reminder that we can all overcome our battles and challenges with a little bit of help. To send flowers in memory of Delbert Leslie Winters, please visit our Heartfelt Sympathies Store. We encourage you to share your most beloved memories of Delbert here, so that the family and other loved ones can always see it. You can upload cherished photographs, or share your favorite stories, and can even comment on those shared by others. 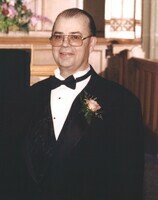 Provide comfort for the family of Delbert Leslie Winters by sending flowers. Some of my fondest memories as CAO for the Municipality of Grey Highlands were from many afternoons and evenings at the Maxwell Hall with "Mayor Winters". He, Merve and Stan were tremendous community builders. Delbert was a generous man with a tremendous wit accompanied by a sense of decency. At Merv's funeral, with tears in his eyes, Delbert confided, "I am last of the 3 Musketeers". He will be missed.